This book is the outcome of the Sir Hersch Lauterpacht Memorial Lectures delivered by the author at Cambridge University in 2001. 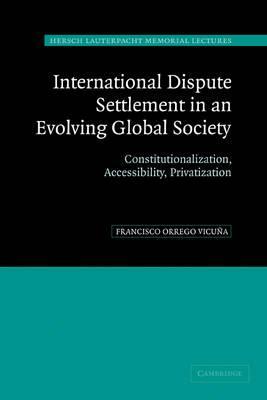 It addresses three salient issues of contemporary international dispute settlement: the development of international constitutional law in a global society; the increasing access of the individual; and the developing role of international private arbitration. The book discusses recent thoughts and proposals concerning a new role for the International Court of Justice in performing judicial constitutional functions, with particular reference to the United Nations and the trends toward the recognition of judicial review. It also addresses the question of the eventual establishment of an International Constitutional Court. The increasing access of individuals to international dispute settlement is examined in the light of ICSID arbitration, free trade agreements and other developments in the WTO. Emerging trends in the organization of international commercial arbitration are discussed in the light of privatization arrangements. Introduction; 1. An evolving international society: institutionalization, privatization, globalization; 2. A constitutional court for an international society? ; 3. Individuals and settlement of international claims: change and adaptation of governing rules; 4. Individuals before international courts and tribunals: a continuing progression; 5. Shaping a new role for the individual in international dispute settlement: the contribution of specialized jurisdictions; 6. The World Trade Organization integrated dispute settlement system: innovation and transition. Professor of International Law, Institute of International Studies and Law School, University of Chile.